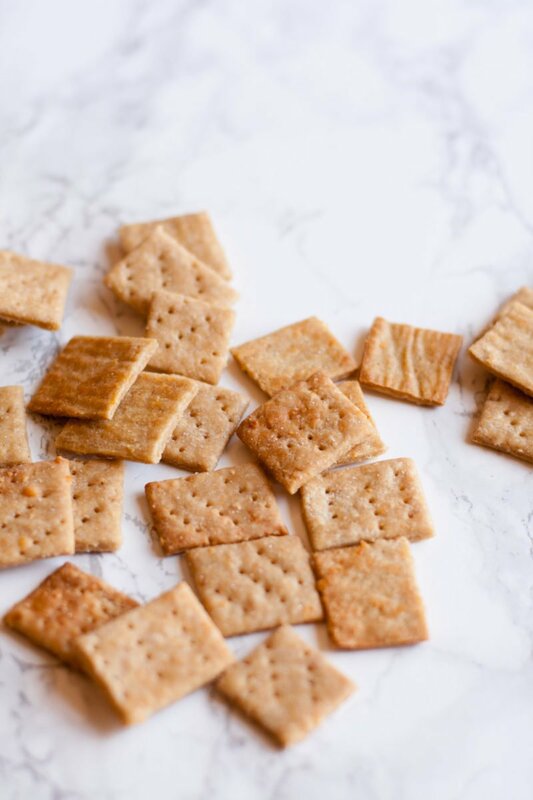 Skip the box and instead try your hand at making these whole grain Parmesan Whole Wheat Crackers at home. You’ll never go back to the box! Back before I had a little nugget running around the house, I was the queen of all things homemade. I made my own marshmallows for s’mores when we went camping. I sewed all my own baby wipes before Juniper was born. There were a few years where I even handmade all the Christmas gifts for my large family. And like all super naive first-time-parents-to-be (there is literally nothing that can prepare you for it—nothing), I assumed I’d just go along in my happy homemaking ways after the ball of cuteness that is Juniper arrived. I even bought a pattern and some new fabric to sew a new travel bag during my maternity leave, because I thought I would have so much free time! It took me a good six months after Juniper was born to accept that I wasn’t going to be the homemade-everything kinda girl I was before. Another six months to not feel guilty about using jarred pasta sauce and buying burp cloths and handing out gift cards to my nieces at Christmas. And another six months to feel proud for doing what was best for me and my family at the time. And now, slowly, a few months after that, I’m beginning to incorporate back in some of my handmaking ways. The truth is, I still crave homemade. I still desperately love my back to basics tendencies, but I’ve also come to grips with the fact that in order for me to be a good mom, a good wife, a good businessperson, and still take care of myself, I have to let go of some of those desires to be all from scratch all the time. There are some moms who can juggle it all and do it beautifully, and I am so happy for them. I am not one of those moms. So, at least for now, I still buy jarred pasta sauce and my nieces and nephews still get gift cards for birthdays and holidays. And it’s fine. But, like I said, now that the nugget is closing in on two (! ), some of my old ways are making a return. She’s a little bit more independent, and I (sometimes) get to (almost) sleep through the night, which means I (sometimes) have enough energy to do crazy things like grind my own flour, bake my own whole wheat crackers, and make my own hummus. Which makes my heart very, very happy. My heart sings when I can live a from-scratch life! Now that I’m back to some of my homemaking ways, I’m back to loving some of my favorite from-scratch-friendly brands. Today, I’m working with one of them—Palouse Brand—to talk about all things wheat berries and hummus! Palouse is a family farm out of Washington state that focuses on sustainably growing lentils, beans, and wheat berries. I’ve been buying Palouse Brand wheat berries for years (they sell them right on Amazon—even with Prime shipping!) for eating and grinding into flour. Grinding your own flour is one of those things that is something I think everyone should experience at least once in their lives. Freshly ground flour has such a wonderful nutty, fresh flavor to it! If you get really into grinding your own flour, you can invest in your own flour mill, but if you just want to try it out for funsies, most high-powered blenders or food processors will do the trick. Even a coffee grinder will do it (albeit a tiny bit at a time). 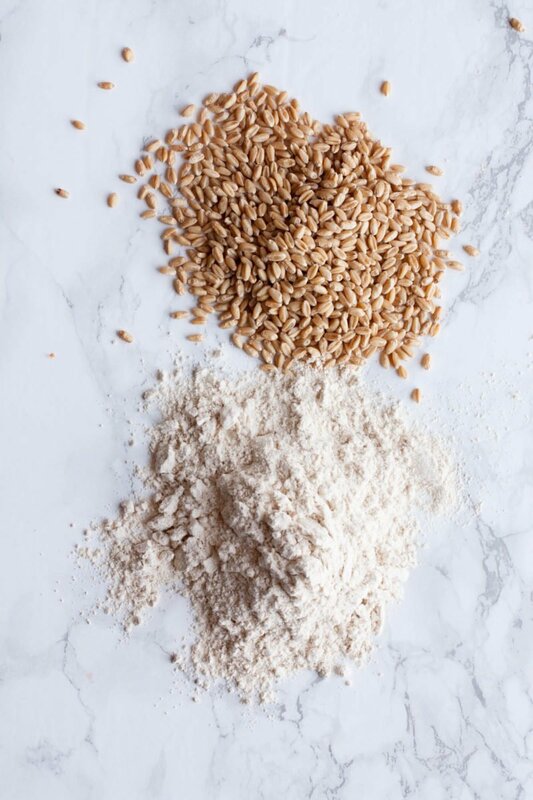 Without a highly quality flour mill, don’t expect to get really fine flour—but you can get flour that is ground enough to make a nice rustic loaf of bread. And know that you made it from scratch! 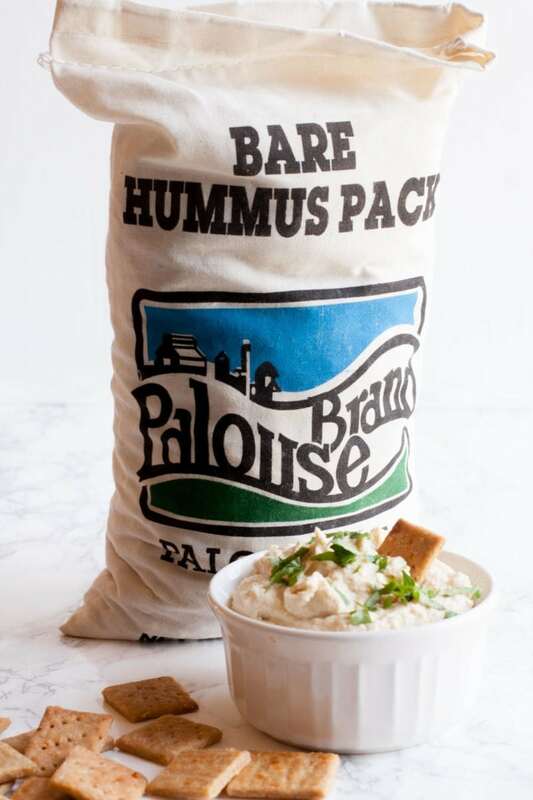 If you don’t have a flour mill (or any interest in grinding your own flour), Palouse Brand has another awesome and easy way for you to do some from-scratch cooking—their über cool Hummus Recipe Kits. These bags are filled with the stuff you need to make seven pounds of hummus from scratch! Inside are dried chickpeas, sesame seeds, and seasonings. All you have to add is water and oil. It’s a really affordable way to make high-quality, all-natural hummus. Each of these bags equals 12 regular-size tubs of hummus! You can make it all at once (if, you know, you want to have a hummus party) or you can make a little bit at a time. You can even freeze hummus if you want to prep it all ahead of time. I love these hummus kits because they give you the joy (and tastiness and affordability) of making hummus from scratch, but cut out all the guesswork of seasoning, gathering ingredients, and figuring out a recipe. All that is included! It’s like the best of both worlds. If you’d like to learn more about the Palouse Brand Hummus Recipe Kits, they have a video out that shows the whole process. And if you make it to the end, there might just a be a coupon code to save you a couple of bucks. Now that you know where to get your dip supplies, let me talk a little bit about these whole wheat crackers! 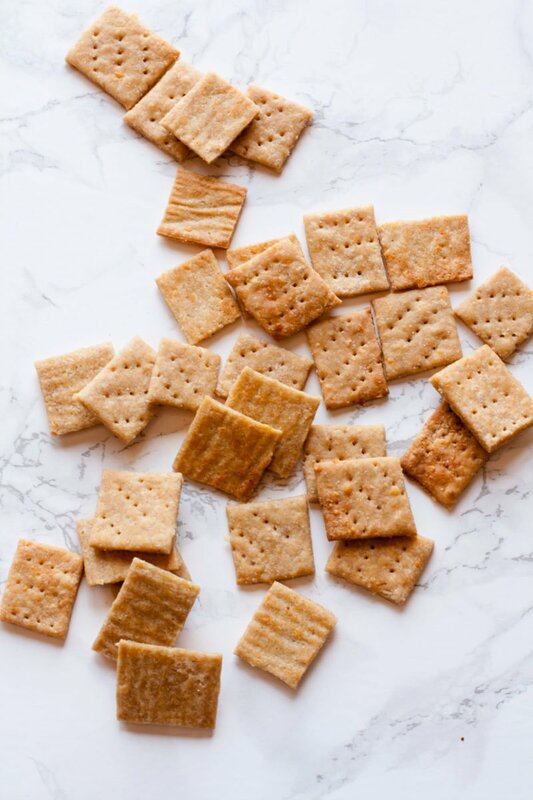 If you’ve never made crackers at home before, you HAVE to try it sometime. 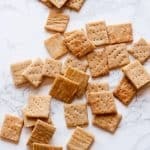 The ingredient list is short, it doesn’t take long to make, and they are so much tastier than crackers from the store. I love this recipe because they are 100% whole wheat (using white whole wheat flour that you either grind yourself or grab pre-ground from the store), and have a nice, light cheese flavor. Perfect for dipping in all your favorite hummus recipes! 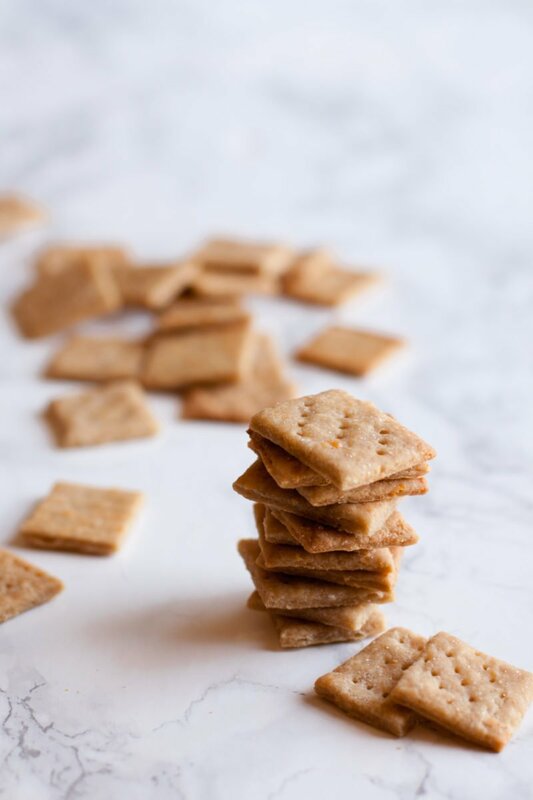 These whole wheat crackers will stay good in an airtight container for upwards of a week or two—honestly, you’ll probably eat them all before they even come close to going stale. 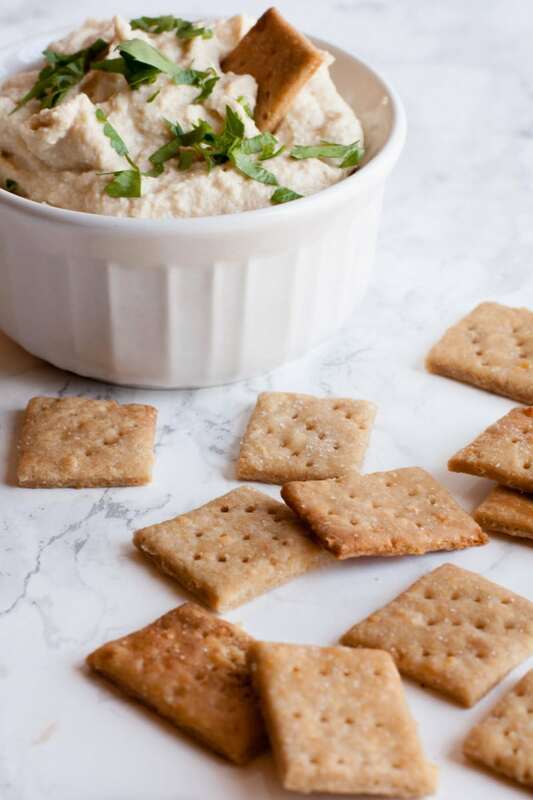 This recipe makes a decent-sized batch (about four dozen crackers), but I tend to double it so we can snack on them for weeks at a time. Enjoy! In the basin of a food processor or in a bowl by hand, combine the flour, sugar, salt, and cheese. Pulse or stir until just combined. Add in the butter and pulse until the butter is chopped a bit smaller than the size of a pea. If doing it by hand, you can cut the butter in using forks or a pastry blender. Add the water, two tablespoons at a time to the mixture. Pulse or stir until well-distributed. Keep adding water until the mixture holds together into a dough when squeezed. Dump the mixture onto a floured work surface. Divide into three piles, and then form into discs. Wrap each disc in plastic wrap, and chill for 10 minutes. Preheat oven to 400°. Working with one disc at a time, unwrap and discard the plastic wrap. Place the disc on a large piece of parchment paper and roll out until paper thin. Using a pizza cutter or a sharp knife, cut dough into 1 1/2″ squares. Using a toothpick, dot the tops of the crackers. Then sprinkle with salt. 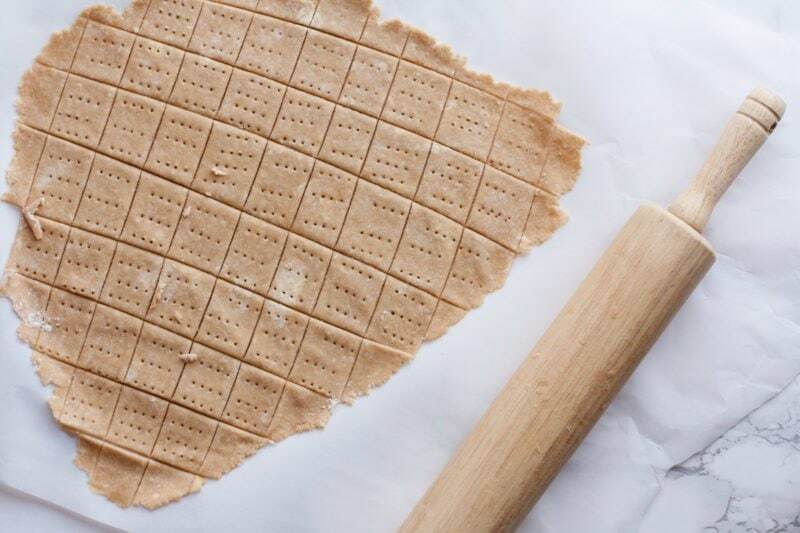 Transfer the parchment paper, with crackers on top, to a large baking sheet. Bake in preheated oven for 5 to 7 minutes or until crispy and golden. Let cool completely. You want to roll your dough as thin as possible. It should almost be see-through kind of thin. The final cooking time depends a lot on the thickness of your crackers, so watch the first pan-full closely. Poking holes in top of the dough isn’t just for the cuteness factor, it helps any air pockets from bubbling up and causing bumpy crackers. When baking, the crackers on the outside of the pan might be done before the others. If you see some that are finished, you can scoop them off the parchment with a spatula and set them out to cool. These crackers only crisp up when completely cool. They’ll still be a bit chewy straight out of the oven. This is a sponsored post written by me on behalf of Palouse Brand. All opinions are entirely my own. Learn more about Palouse Brand by visiting their website or following them on Twitter, Facebook, Pinterest, or Instagram. The crackers sound really good. I am going to try making them. I keep hearing that most people feel “normal” again starting right around that 2 year mark. The fact that Juni can pretty much keep herself entertained while I workout for a half hour is LIFE-CHANGING! Sure can! You are way more clever than I am. HA! I feel like one of these farms that grow pulses (I just learned that word the other day!) out West would be my dream vacation spot. Can I go visit your family for vacation? Ha! Is that weird? Sorry, but is there any alternatives to parmesan cheese in this recipe?